AICGS is pleased to welcome Mariam Salehi as a DAAD/AICGS Research Fellow from mid-April to mid-June 2019. Dr. Mariam Salehi is a postdoctoral researcher at the Center for Conflict Studies, University of Marburg. While working toward her PhD, she was as a research fellow in the research network “Re-configurations. History, Remembrance and Transformation Processes in the Middle East and North Africa,” funded by the German Ministry of Education and Research. 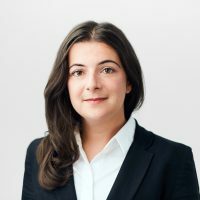 Prior to coming to Marburg, Mariam was a research associate at the chair for political science with a focus on international politics at Helmut Schmidt University, Hamburg. Her research interests are situated at the intersection of International Relations and Peace and Conflict Studies. They include transitional justice and processes of political and social change. She has written about her research for academic and non-academic publications, among the latter for openDemocracy, Internationale Politik, Frankfurter Rundschau, and The Washington Post’s The Monkey Cage blog.